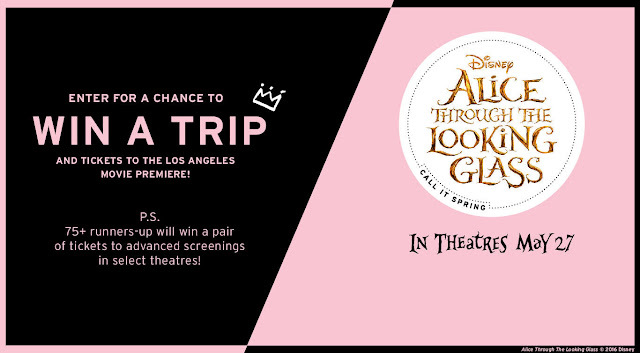 Call It Spring wants you to enter once for your chance to win a trip to the Los Angeles movie premiere of Disney's Alice Through The Looking Glass and runner up winners will get tickets to advance screenings! Grand Prize (1): A trip for two (2) for three (3) days and two (2) nights to Los Angeles, California (or such other location as designated by Sponsor) (the “Trip”) and a pair of tickets or passes (2) for an opportunity to attend the worldwide premiere of the Alice Through The Looking Glass movie (the “Event”) in Los Angeles for an approximate retail value of $3,000 CAD ($2,310 USD) plus Call It Spring merchandise for an approximate retail value of $300 CAD ($231 USD) (the “Grand Prize”). Grand Prize includes: (a) two (2) round-trip flights in economy class for Grand Prize Winner and guest between a major gateway airport nearest to Grand Prize Winner’s residence to an airport selected by Sponsor in the Los Angeles, California area; (b) a two (2) night stay in a double occupancy room at a hotel selected by Sponsor; and (c) two (2) tickets or passes to attend the Event. This Sweepstakes ends on 05/13/16 and you can ENTER ONCE to win.